Black holes are creating havoc in unsuspecting places, according to a new study equipped with NASA’s Chandra X-Ray observatory. Astronomers have found the first pair of super-massive black holes in a spiral galaxy similar to the Milky Way. The most astonishing part for the astronomers is the discovery of first reaching explosives activity due to these giant black holes in these old galaxies. After researching about them in detail, the astronomers have discovered that the super massive black holes are with masses ranging from millions to billions of times of the sun and are locating at the centre of the galaxy. They have the capacity to guzzle up a large amount of gas and dust that have been taking a shape of a disc around the mass which later falls into the black hole and a large number of particles streams out seeming as cloudy strips. When the matter falls towards these black holes, it glows with such brilliance and they can be seen billions of lights years away. 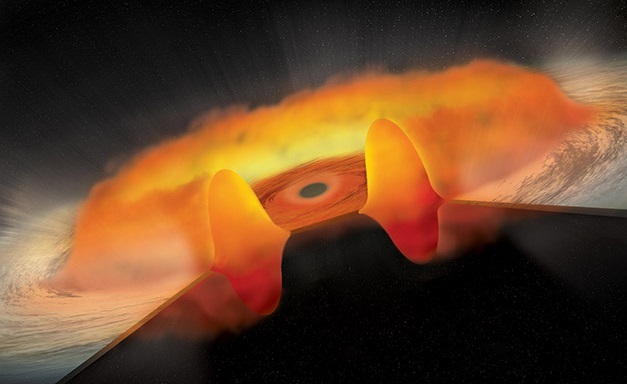 Astronomers named these voracious black holes “quasars”. After gathering data from 51 quasars which were perceived by Chandra, the group looked at the data more intently and observed that these quasars seemed to produce low carbons emissions at ultraviolet wavelength. This information led them to run assumptions which ceased that there are some quasars which are like hungry beasts that allure ample amount of gas and dust which make a structure like donut instead of the disc around the black hole. The insatiable quasars acts as a protector to these donuts. They defence these donuts from snooping telescopic eyes. Thus it seems so vague to Chandra. “If a quasar is embedded in a thick donut shaped structure of gas and dust”, said team member Jinfeng Wun. “The donut will absorb much of the radiation produced closer to the black hole and prevent it from striking gas located further out, resulting in weaker ultraviolet atomic emission and x-ray emission”. There have been possibilities shown of the black hole growing at a much faster rate than others. The good news it’s not devouring in the moment, at least not until the milky way diverges with Andromeda in around 4 billion years. 5 Health Apps for fitness freaks: Check ’em out! Theory comes before the math. Someone had a thought about a subject or a concept and math is created to prove that theory. In the day and age that we live in now we have big science to help prove the concept and the math. I have my own theory about how the universe works, here it is. Black Holes take the matter from our universe that falls into it and does what to it? mater cannot be created or destroyed only changed from one form to another partial physics shows us that. I would compare CERN to a black hole because the CERN accelerates mass (Plasma) up to the speed of light and smashes it together, and that black holes accelerates mass (Plasma) to the speed of light and it smashes into the black hole, possibly creating the same kind of event and producing the same quantum particles that CERN does. Except that their may be hundreds of trillions of black holes throughout the universe converting billions of tones of mass (plasma) all over our universe. This converted material has to go some were, I called the place the Dark Matter Universe, but it could be called the Quantum Universe, or the Anti-Matter Universe or even the Particle Universe. There are many types and flavors of quantum particles released during the LHC process of breaking mater down into it’s fundamental form looking for the Higgs particle. (They say that they found it.) My theory is that a spinning black hole could act as a centrifuge that separates the different elemental particles from each other. By that I mean separating them by forms, flavors and weight. Some heavy, some light and some mass less. In other words layers them according to their properties. Not as solid but as in a fluid or gas like state. The weightless particles would because they have no mass migrate away from particles that have mass, sort of like a gas that fills a balloon. Lets say that this weightless mass is the Higgs particle. I just explained to you how I think the process works. In the You Tube video, “The God Partial” The Higgs Boson. Best of Science. Said that the Higgs partial was released into our universe first and that space at absolute zero had an effect on the Higgs partial alluding that the combination of space and the Higgs partial caused the other quantum partials to form the mater in our universe. If that theory is correct then where did all of the quantum elements come from to make the mater from Big Bang in the first place? It had to come from black holes. Their has to be some system in place, some phenomena that creates dark matter and energy. Logic says that the only possible thing that can do that are Black Holes. It seems that dark matter clumps around galaxies. If that’s true it would mean dark mater could be the cement that holds galaxies and even solar systems together and that galaxies maybe directly attached to the dark mater universe because of that phenomenon, and because our universe is attached to it as it expands we move along with it. Were did all of the anti-matter in our universe go? Anti-matter is still present in our universe. It’s bound up within the ordinary matter that exists in our universe. Anti-matter is released during radioactive decay, also at the CERN were it’s produced and captured. Anti-matter was possibly used up during the formation of the mass in our universe. Used up is not the right description for it. Because once the big bang occurred in that instant the quantum soup of particles of that eruption entered into the vacuum of our universe, and the Higgs Field slowed the elemental particles down to form mass and the anti-matter that was stored in the dark matter universe came into contact with the mass that was created. That could have been what the big bang may have been. A matter, anti-matter explosion of universal proportions, with the theoretical temperature one-hundred thousand times hotter than the sun. The CERN reverses the process, breaking down mass into it’s elemental state, with the theoretical temperature one-hundred thousand times hotter than the sun. were as the Big Bang created mass by fusing the partials released into our universe, CERN breaks it apart. That’s it, my thoughts and opinion about that subject. Hope you like it.